As close as sisters for twenty years, Sarah and Lauren have been together through high school and college, first jobs and first loves, the uncertainties of their twenties and the realities of their thirties. With impeccable style, biting humor, and a keen sense of detail, Rumaan Alam deftly explores how the attachments we form in childhood shift as we adapt to our adult lives—and how the bonds of friendship endure, even when our paths diverge. Deceptively easy to read, Rich and Pretty is a complex testimony to the resilience of female friendship. With clarity and heart, Rumaan Alam brings to life the fraught, bewildering and beautiful nuances that keep us reaching for each other over decades. 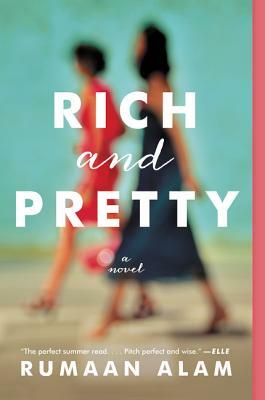 “Rich and Pretty is a beautifully written novel, a lushly detailed portrait of the mores and manners of contemporary Manhattan and a penetrating look into the heart of the generation now facing their thirties... wickedly witty, keenly insightful, and deeply, compassionately wise. This one’s “Gossip Girl” with a grown up twist. About two NYC women who’ve been this-close all their lives, but are moving in different directions. You’ll get all the feels. And then text your BFF.